No one yet knows what deals US President Donald Trump may have struck with Russian President Vladimir Putin during their private two-hour meeting in Helsinki. But it is already clear that Trump’s self-congratulations for striking a deal to “denuclearize” the Korean Peninsula during his Singapore summit with Kim Jong-un are ringing hollow. In addition to backsliding in its working-level negotiations with the United States, the Kim regime has continued to solidify its position as a nuclear-weapons state. The master of the Kremlin is sure to have taken note of this. North Korea specialists have long been skeptical that Kim would ever give up his nuclear arsenal, and recent evidence supports their judgment. Reports citing US intelligence officials indicate that the North is pressing ahead with its nuclear-weapons program, by ramping up missile and enriched-uranium production and concealing the size of its nuclear inventory. Anyone who has followed affairs on the Korean Peninsula has seen this movie before. After all, Kim’s father and grandfather wrote the script decades ago. Since the 1970s, the Kims’ regime has repeatedly expressed its desire for a nuclear-free Korean Peninsula, signed non-proliferation agreements, and negotiated with the US and South Korea -- all while pursuing its nuclear-weapons program. In this latest rerun, Kim has even reused his father’s special effects. In May, he blew up a nuclear test site with the same cinematic flair that Kim Jong-il displayed when he dynamited a nuclear reactor’s cooling tower 10 years ago. Compared to Kim’s well-rehearsed theatrics, the Trump administration’s performance has been a flop. After threatening North Korea with total destruction last year, Trump made a major concession to Kim by agreeing to attend the summit in June. While there, he demonstrated that neither he nor his administration had a strategy for getting Kim to make good on any deal. Making matters worse, Trump has continued to insist that follow-up talks with the North are “going well,” even though US Secretary of State Mike Pompeo’s last visit to Pyongyang ended with a round of mutual recrimination. Behind the crumbling facade of Trump’s misrepresentations is an administration that remains divided on its primary policy goals. In light of the intelligence community’s latest assessment about the North’s continued enrichment activities, those divisions are likely to have deepened. For his part, Pompeo has already backpedaled on earlier US demands, by softening his language on the fraught issue of inspections and verification. And US officials have hinted that a further softening in the administration’s position is on the way. Meanwhile, other White House officials have taken a harder line. Trump’s national security adviser, John Bolton, has called for not only denuclearization, but also rapid disarmament of all of North Korea’s unconventional weapons. This month, Bolton even claimed to have a plan for dismantling all of North Korea’s nuclear-, chemical- and biological-weapons programs within a year. Trump prefers top-down decision-making, so it remains to be seen how he will respond to intelligence reports about the North’s duplicity. At any rate, now that the US has shared its intelligence with Japan, South Korea and other allies, political leaders and military officials in those countries have reason to be anxious. For Japan and South Korea, in particular, the contradictions between Trump’s rhetoric and his own intelligence services’ findings are becoming a source of serious concern. Equally worrying is Trump’s unpredictable behavior toward US allies. Officials in Tokyo and Seoul closely followed Trump’s blustering appearance at a NATO meeting this month, because they, too, have been on the receiving end of his attacks over military spending. Trump has pushed both governments to boost their military budgets, and he has long mused about withdrawing US forces from South Korea. At the Singapore summit, he even agreed to suspend US military exercises with South Korea -- another major concession to the North -- further unsettling America’s Asian allies. Trump’s silence on the latest North Korea intelligence -- to say nothing of his siding with Russian President Vladimir Putin over his own intelligence agencies on charges of Russian meddling in the 2016 US election -- will further deepen allies’ anxieties. Ignoring North Korea’s deceptions directly undermines the security of Japan and South Korea. Though the Kim regime is still working toward nuclear-armed intercontinental ballistic missiles capable of reaching the continental US, it already has fully operational medium-range missiles that can strike its neighbors. And, because Japan and South Korea both host US military bases, they are at the top of the North’s nuclear target list. Trump may not like it, but he must call out Kim’s duplicity, especially given the latest intelligence. Among other things, the North is accelerating production of solid-fuel rocket engines and an ICBM-armed submarine. Both technologies would bolster the North’s ability to launch a surprise attack, by making its nuclear arsenal more durable, mobile, and easily concealed. The Kim regime’s ongoing efforts in this area make clear that it has no intention of scrapping its nuclear program. White House officials are now suggesting that Trump could use the United Nations General Assembly meeting in September to hold another meeting with Kim, as if rekindling the two leaders’ “bromance” will lead to serious negotiations. It won’t. Instead, Trump needs to put substance before spectacle, above all by confronting Kim with the latest intelligence findings. Platitudes about denuclearization are one thing; serious arms-control efforts to reduce the risks on the Korean Peninsula are quite another. The Trump administration must think very carefully about its next steps. 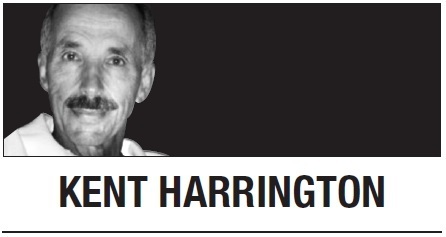 Kent Harrington, a former senior CIA analyst, served as a national intelligence officer for East Asia, chief of station in Asia and the CIA’s director of public affairs. -- Ed.